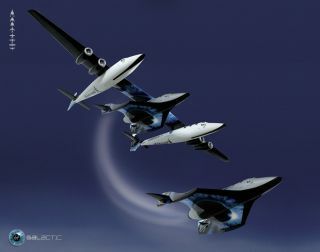 An artist's illustration of a SpaceShipTwo drop launch from its mothership WhiteKnightTwo. Suborbital space travel is on the verge of a renaissance, experts say, with short jaunts to the edge of space becoming more popular for research and soon to be available to tourists. Though suborbital vehicles don't make a full orbit around the Earth, they do fly high enough to offer a view of the blackness of space and Earth below, as well as about five to 10 minutes of weightlessness. Several firms are racing to send the first paying passengers aboard these suborbital spaceships. Virgin officials have said they plan powered rocket tests of the vehicle by year's end. Another suborbital hopeful is XCOR Aerospace, whose Lynx suborbital spacecraft is designed to carry two people to space and back, taking off and landing via a conventional airport runway. Additionally, a company called Armadillo Aerospace is developing a reusable suborbital rocket, Stig, that lifts off vertically like a conventional orbital booster. The secretive Blue Origin company, started by Amazon.com founder Jeff Bezos, also has a suborbital vehicle in the works. The ticket price for a ride aboard one of these spaceships will range between $100,000 and $200,000 — a steep price for sure, but a bargain compared to orbital space travel. "I know the interest is growing," said Alan Stern, a planetary scientist at the Southwest Research Institute who runs the annual Next-Generation Suborbital Researchers Conference, a gathering for scientists interested in flying experiments aboard suborbital craft. "I think once the vehicles are flying it's going to take off." While the companies have been conducting test flights, none have yet flown a commercial mission. Scientists like Stern, who has booked suborbital flights for Southwest Research Institute scientists, are eagerly waiting for their turn. So is NASA, which contracted seven companies to fly unmanned suborbital research payloads for the agency through its Flight Opportunities Program. Scientists say even those few minutes of microgravity aboard suborbital flights provide promising opportunities for studies of human health, upper atmospheric research, materials science, and more. "We've bought six flights on XCOR and three flights on Virgin," Stern told SPACE.com. "In both cases we're waiting for them to go operational." Also waiting anxiously are the numerous non-scientists who have reserved tickets for the joyride of a lifetime. Already, more than 500 people have bought tickets on Virgin Galactic (actor Ashton Kutcher was the 500th to sign up). "I think they’ll fly when they're ready and there's nothing I can do about it," Stern said of the wait. "They want to make these vehicles safe and reliable, and we want them to be safe and reliable because we're flying on them. It's to everyone's advantage if they get it right from the start." Though exact timelines aren't set, the first suborbital passengers are likely to fly by the end of 2013, experts say. You can follow SPACE.com assistant managing editorClara Moskowitz on Twitter @ClaraMoskowitz. Follow SPACE.com for the latest in space science and exploration news on Twitter @Spacedotcom and on Facebook.